©1993 Chris Gray Enterprises Inc.
Space Funky Bob, aka B.O.B in the west, is a side scrolling platform game featuring a goofy robot (or space-insect, hard to tell) engaged on a rescue mission - his own. After crashing his dad's space-car on an unknown asteroid, Bob must find his way home. The curious asteroid, actually made of three small planets, is covered with dome-like structures and forest-like jungles. As expected, each one of them hide various monsters and hazardous underground constructions. And our friend must go through each area within a short time limit. Bob can use a large arsenal of guns but also his fists (which tend to grow huge for the occasion). The game also features some interesting special items (called remotes) such as Bombs, Flying Hats or trampolines without forgetting the special abilities he has built-in - he can use his fingers to slide along ceiling pipes or crouch and move like a crab. The goal of the game is to reach the blue transporter beam located at the end of each stage and to warp Bob out to the next area - he then thanks the player with quick dance moves and funny jokes. A password system allows the player to save his progress every handful of stages. 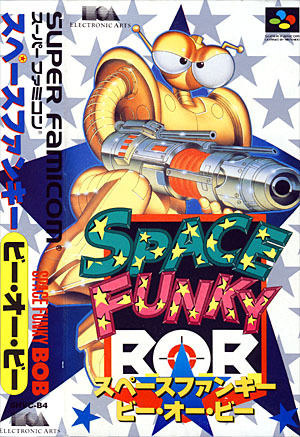 Space Funky Bob was also release for Sega's Megadrive in 1993. Space Funky Bob doesn't really have a lot of substance to it. It's fun for a little while but things get quickly annoying and repetitive. Controls are smooth but they're sometimes not as responsive as you'd expect them to be (especially during jumps). Graphics are also cute and cartoony, but I find them uninspired and they often attempt to be 'funny' but fail miserably. The thing that annoys me the most are the dumb dances and speech bubbles the developers felt obligated to stick at the end of each stage (If you happen to play the Japanese version and not know the language, you won't miss much, really). Despite what people usually say about this game, I find Space Funky Bob really average. 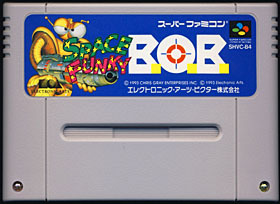 Space Funky Bob is missing this 'little something' that could have make it an excellent game.